After a busy week at work, it was nice to work in a bit of scrap time here and there over the long holiday weekend. 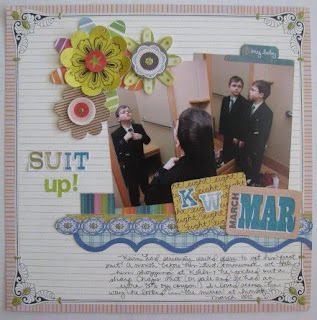 I still had my "Sweet Sue" kit from Noel Mignon strung out across my desk, so I kept working with it. When I first opened my kit and saw the "Four" and "FEB" cards from Sassafrass Lass, I started counting out to see when my niece was four months old. I had pics from her in early February wearing an outfit I purchased right after my sister had her (incorrect) first ultrasound that said she was having a boy. It was the perfect opportunity to scrap this story. I cut down the backside of one of the Sassafrass Lass papers, but at the last minute decided to turn the layout on it's side (turning the lines, too!). Still, I am really happy with how it turned out. Two of the other Sassafrass Lass cards were "eight" and "Mar." Since Kevin is 8, I pulled out photos of him in March. I loved these shots I took of him trying on his suit for his First Communion at Kohls. The ruled paper I used for this layout was on the backside of my least favorite sheet of paper in the kit. I love the ruled side though. The kit also came with Stickles. I don't use them very often (mainly on Chirstmas decorations! ), but I wanted to put them to use. I decided to accent the shapes in the corner of the layout and also on some of my flower centers. I also dotted the centers of the blue oval sticker strip under my photos with Stickles. 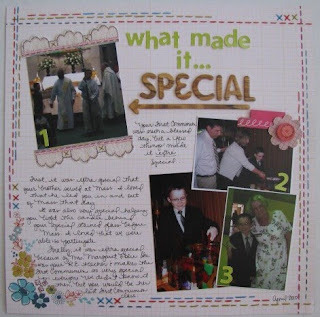 I have photos of Kevin's First Communion pulled to go with this kit, too. (I have a TON of it left! Stay tuned for more layouts!) I will scrap parts of the day in order, but also wanted to pull out a few shots that really made the day special. This layout is also on a "backside" of Sassafrass Lass paper. I love how it looks like it had hand-stitching on it. I think Kevin's First Communion was extra special because 1) Blake served at Mass, 2) Tom and I were involved in part of the prep (lighting Kevin's stained glass candle) before Mass, and 3) Kevin's teacher Ms. Margaret. AWESOME work Amy!! 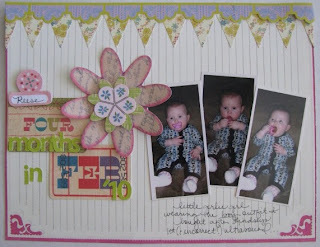 I love the stickle action and I'm with you on the flip side of the Sass Papers, those are my fave!